It’s here! And just in time for the cooler weather. 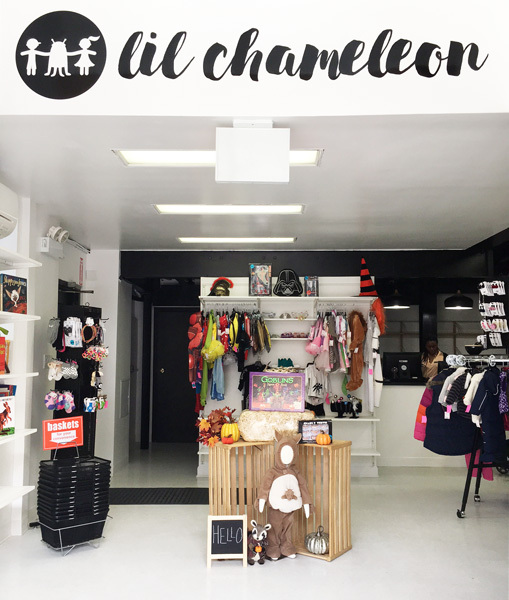 Lil Chameleon is a kids resale store, a mommy-and-me lounge, and your new venue for all kinds of kid (and some kidfree) classes. We recently visited and were super-impressed by how much there is to do in a space that feels open, friendly, and relaxing. Interested in a free trial class? Register online to sample some of the classes offered from October 10–19. Click here to view classes and register. You can go to the larger kids-consignment shops and find lots of clothes. But they can also get overwhelming really quickly, and there’s…just…so…much…STUFF! Lil Chameleon is more of a resale boutique where the collection is curated so you know you’re getting high-quality, adorable items in great condition. You won’t find a “10 onesies for $1” bin here but you will find tons of cute clothes you can’t wait to put them in for under $10. They’ve got toys and accessories too. We went in and saw loads of gently worn Halloween costumes for less than full-price. Come in to shop or to sell your own stuff. They offer competitive sell/trade deals for your best used kids items. And we couldn’t help but gush over the rack of new bows, headbands, and watches. Our favorite spot is the kid-friendly self-service café and lounge. Selling both healthy and indulgent snacks for parents and kids, it’s a great spot to take a break and the perfect solution to the problem of where to have those cold or rainy day play dates. On our recent visit my crawler had a blast exploring the toy corner while I relaxed on the couch. It’s like the living room you always wanted: stocked, cozy, and perfect for a mom meetup. In fact, BabyGotChat is hosting a (free!) mom get together Tuesday, October 17 at 11am. Join us to meet other moms and relax while your kids play together. Come for the award-winning Baked By Susan treats and other snacks, playtime, and shopping, stay for the classes. Classes are launching soon for all ages. And these aren’t your typical mommy-and-me classes. Lil Chameleon classes range from subjects such as “Spanish Through Music”, “Fertility & Pre-Natal Yoga”, “Toddler & Me Yoga”, to “Make Your Own Gourd Instrument”, “Expectant & New Moms Circle and Stretch” and more. We hope to see you on Tuesday the 17th for our 11am get-together, and don’t forget to register online for free class demos from October 10-19. And as always, check our website for events and weekly library programs.